2. What's it like as a running watch? The Fitbit Surge has been superseded by the all-new Ionic and it's now pitted against many more serious fitness trackers. But with GPS tracking, real-time workout stats and a heart rate monitor, it still boasts competitive specs, particularly if you can hunt out a knocked-down price. Update: Since we first reviewed, Fitbit has updated its companion app to offer more robust sleep management tools via Sleep Schedule. It has also launched a new Fitbit Coach app, offering personalized coaching for running and general fitness. Plus the company has the Fitbit Ionic as its newer top end watch that replaces the Surge. Fitbit Surge is the fitness tracker that has so many new features, the start-up company behind it calls it a "superwatch" next to the more normal Fitbit Charge and Fitbit Charge HR. There's good reason for that label. The final version I tested has built-in GPS, a heart-rate monitor and real-time workout data, all fan-requested capabilities that raise the price. It's certainly a step up from the Fitbit Force that was recalled for causing skin allergies and never saw its promised smartwatch functionality, though a few more rashes have been reported. 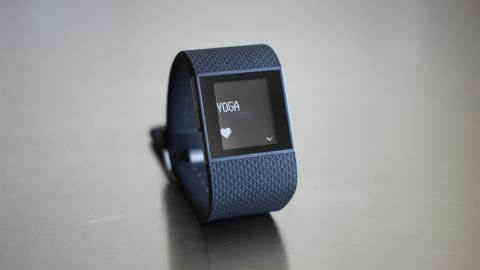 At launch the Fitbit Surge was priced at $250 (£200, AU$350), though now it is possible to find it for less. You can't buy it directly from Fitbit since the launch of the Ionic, but you can find it from third-party retailers. Fitbit Surge reclaims lost territory and squares off against just as pricey fitness trackers, like the Basis Peak, and pricier ones, like the Garmin Forerunner 920XT. Its specs make it one of the most powerful Fitbits, but is it still compelling against a raft of new competition or has it been left behind? Time to put it through its paces. Designed for workout performance, the Fitbit Surge fastens a noticeably larger LCD display to your wrist, and it's able to easily cycle through multiple stats. Gone is the single-line OLED. Fitbit Surge upgrades to a touchscreen, and puts three physical buttons at your fingertips, providing more control to set everything from workout timers to GPS tracking to music controls. The display is not in color and doesn't fit as much information on one screen like the Garmin Forerunner 920XT, but now there's no need to cycle through by pressing a single, tiny button. Tucked underneath the watch band is an optical heart-rate monitor and at the end of the straps is a strong wristwatch clasp that is easier to fasten than Fitbit's usual two-pronged approach. The new watch clasp is two Fitbit-sized steps in the right direction. It's also available on the Fitbit Charge HR, but not the Fitbit Charge, so avoid that version if you tend to lose things. While the Fitbit Surge functionality is more advanced, the square look and bigger size is akin to a dated, '80s digital watch. It's not fashionable, yet stands out more than previous Fitbits. It doesn't help that it comes in only black, with blue and tangerine "coming soon." At its thickest point, the watch case is half an inch thick off the wrist and its strap is an inch wide. That's about 1.5 times wider than the Fitbit Charge HR band and tough to hide. This means it can track all sort of movements beyond a fitness gadgets' routine metrics of steps, distance traveled and calories burned. An altimeter, for example, is here to monitor how many floors you've climb in a day. That's a stat that's not available in all Fitbits, including the popular Fitbit Flex. The best part is that Fitbit Surge's satellite tracking works without your phone. You can leave that at home, though this is standard feature for most running watches and now also possible with Apple Watch. There's something motivating about reviewing your entire run laid out on a familiar overhead map and trying to best it the next time. You know you need to push it at certain landmarks. Fitbit Surge's GPS tracking isn't the most accurate I've tested, with noticeable smoothing around corners and, at times, off-track routes that are a street and a half over. All is not lost, however, as these GPS errors are few and far between. More often, I found Fitbit's always-inflated step counts to push me to my 1,000 steps goal faster than expected. Run tracking, without or without GPS, can be initiated right from the watch, so there's no need to go to the app screen or press a secret pattern of buttons to get started. A post-launch Fitbit Surge firmware update also added cycling tracking to that list. The new software will also bring Multi-Tracker Support so you can wear as many Fitbits as you want. Needless to say, I never felt robbed of fitness tracking modes with the Fitbit Surge. The app also has a menu for food planning, but it remains cumbersome to track and is worthless. All of the collected data syncs to the Fitbit app as well as an easier-to-study web interface, a bonus that the mobile-only Jawbone Up products don't offer. Next Page What's it like as a running watch?